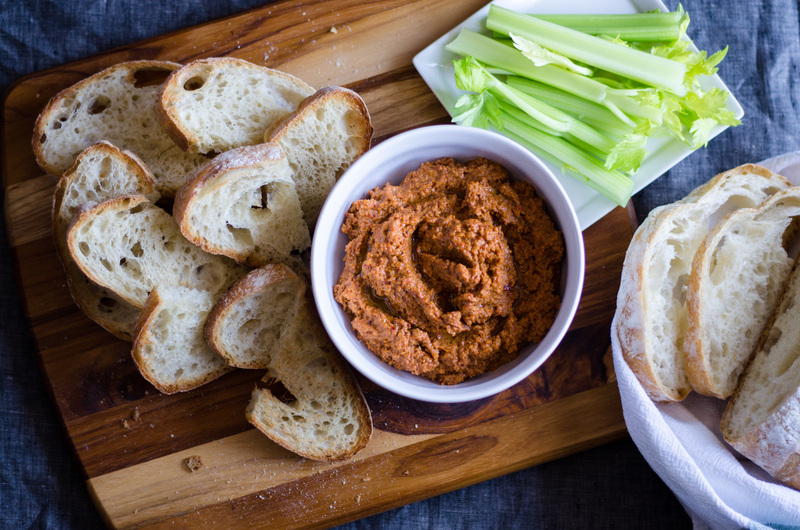 If you aren’t familiar with the roasted red pepper dip, Muhammara, it’s time to get aquatinted. It’s spicy, smokey and just the right level of spice. Amazing smeared on bread or pitas, but also makes a great dip for vegetables. This version uses jarred, roasted red peppers, making it perfect for these dull winter months when fresh local produce isn’t available. It also makes it super quick to whip together on a whim. You can play with the spice levels, adjusting them up or down to suit your individual taste. We love Aleppo pepper, so there’s a good, healthy dose in this version. The texture can also be adjusted by changing the mixing method. We like ours with a more rustic texture, but it can also be whirled in a blender for silky smooth perfection. 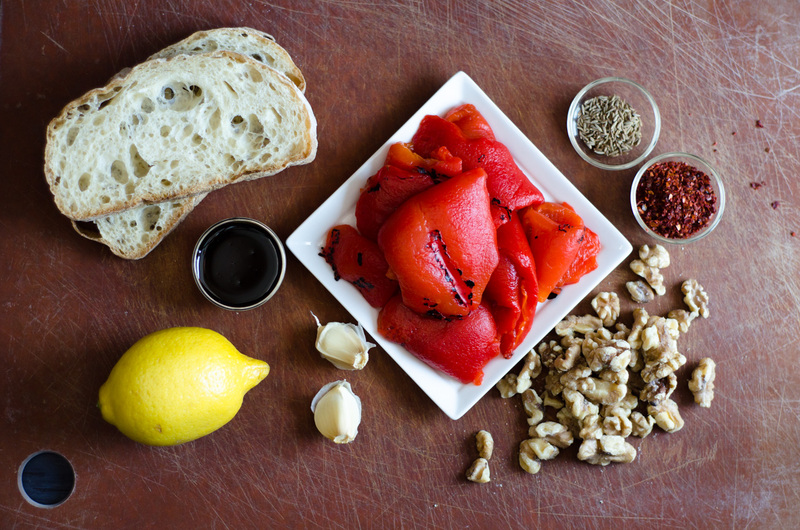 Even when red peppers aren’t in season, you can make awesome Muhammara with jared roasted red peppers. Lightly drying the bread crumbs while toasting the walnuts helps prevent the dip from being watery. 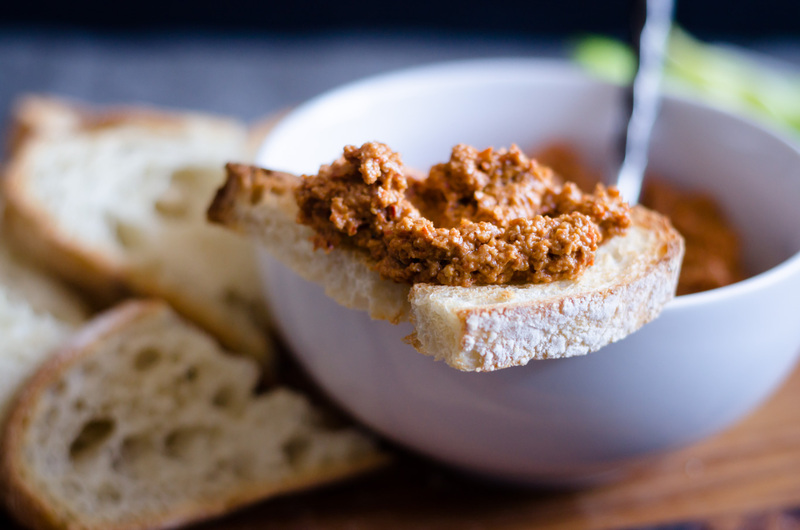 Typically served as a dip with bread, but is also amazing in sandwiches, wraps or as a base for flatbreads. If you like a more texture spread, use a food processor. If you’d prefer a silky smooth consistency, reach for a blender instead. Drain and rinse peppers. Layer between paper towels to dry while preparing other ingredients. On a baking sheet, mound bread crumbs on half of the sheet and spread out walnuts on other half; roast for 5 to 10 minutes to slightly dry crumbs and toast walnuts. Remove nuts to a cutting board to cool. In a food processor, finely chop cooled nuts. 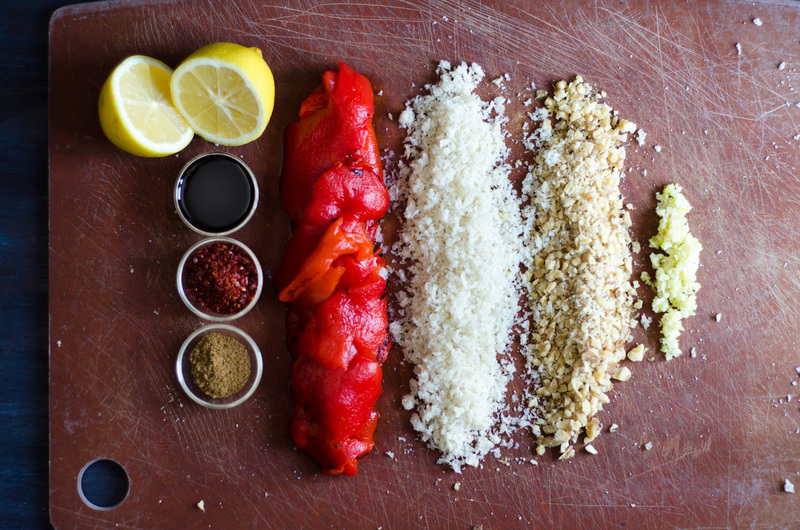 Add peppers and remaining ingredients, starting with 2 tablespoons of olive oil. Pulse 10 to 15 times until desired consistency is reached, adding more oil if needed. Transfer to bowl, cover and refrigerate for 30 minutes to an hour to let the flavors blend. Adjust seasoning. Serve at cold or at room temperature with pitas, toasted bread or raw vegetables for dipping. This recipe was recently featured on Food52!